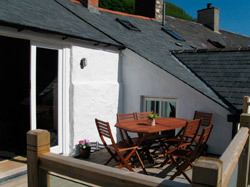 The Sail Loft is a stylish & comfortable first-floor apartment in Lower Solva near beach, harbour & coast path. Sleeps 4 -one double, one twin room (both en-suite). 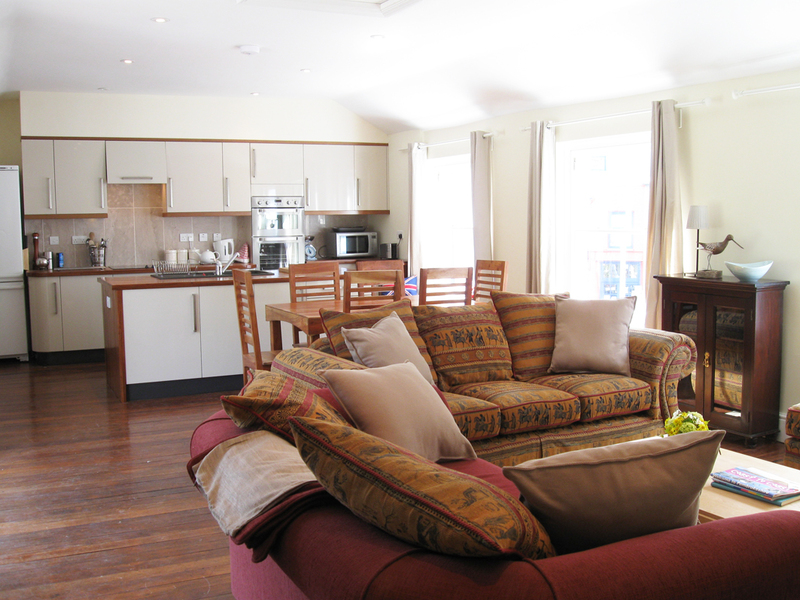 Large open-plan kitchen, dining & sitting room, comfy sofas , TV. Woodburner plus radiators. Deck. Free broadband. Dogs welcome. Parking close by. 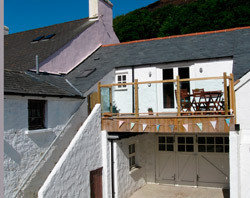 The Sail Loft is a stylish, comfortable and carefully renovated first floor apartment in the heart of Lower Solva, just a minute from the beach, harbour and coast path. Originally stone built and with a long history, it was used for storing sails in the winter. 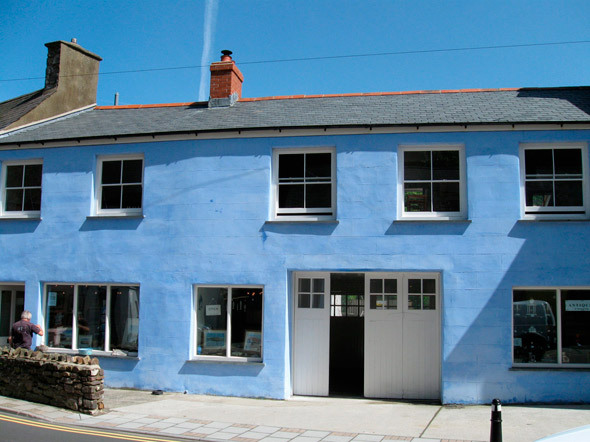 The Loft sits in the heart of the Conservation Area in old Solva and the renovation of the building in 2010-11 used historic building materials such as lime render. We’ve tried very hard to preserve and enhance the character of the old building. Two years of renovation work has only recently been completed - hence lots of availability for this yearThis first floor apartment sits above the antique shop and the Swinfield Gallery with access through a private courtyard (shared) and up a flight of 15 steps. There is a large private south-facing deck with table and chairs at the rear and views towards the woods. 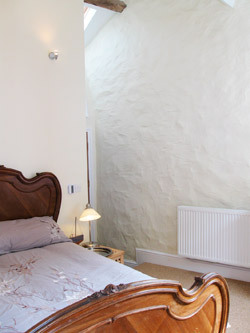 The Sail Loft sleeps 4, one double with antique French bed and one twin room. We are happy to provide a cot and highchair on request. 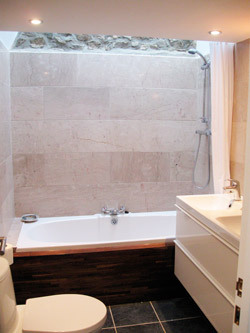 Both bedrooms are en-suite, the double room having a bathroom with bath, shower and twin basins. The twin room has a small, stylish wet room. There is a third loo in the utility room. Bed linen is provided of course, but please bring your own towels. One of the sofas in the open-plan sitting room will convert to accommodate a further two occasional guests. Changeover day is Saturday. Short breaks are sometimes available – please ask. Dogs are welcome by arrangement*, and there are lots of good walkies closeby. We can offer storage for bikes, kayaks, canoes etc. off the courtyard. Parking is available in National Park car park 40ms away. Normally there is a charge for parking but we provide a free pass for one vehicle for your stay, which covers all National Park car parks in Pembrokeshire. We’ll sort this out for you in advance. It is the responsibility of the owner to ensure their dog does not go on the furniture or in the bedrooms. Your dog should not be left unattended and the owner is liable for any damage.